Farro is an ancient grain belonging to the wheat family. 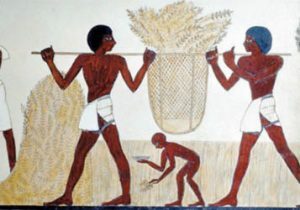 It gave rise to durum wheat, from which pasta flour is made, and spelt, but was replaced in modern times by ordinary wheat because modern-day wheat is easier to harvest and has a higher crop yield. Yet farro has twice the fiber (5 g/serving) and protein (7 g/serving) of modern wheat. It’s also high in minerals: iron, magnesium, selenium, and zinc, as well as B vitamins and vitamin E. In addition to vitamins and minerals, farro is rich in phytonutrients such as cyanogenic glucosides, shown to stimulate the immune system, and lignans and betaine, which help reduce inflammation. The carbohydrates in farro are released into the bloodstream more slowly, which is helpful for those who are diabetic and fight the extra pounds due to insulin resistance. 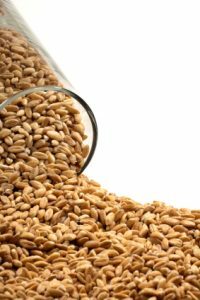 Farro does contain gluten, but at much lower levels than modern wheat, and so is easier to digest and is better tolerated by many individuals who do not have celiac disease but still have trouble digesting gluten. Farro is also a whole grain, which has been shown to help lower cholesterol levels. According to the New York Times, farro is now found in the best Italian restaurants and is delicious cooked like risotto, served under the name farrotto. In fact, they claim it may eventually displace arborio rice. I keep running into it myself. I went with a group to an upscale restaurant and we all tasted almost everything on the menu. All of the food that we tried was delicious, but one of the stand-outs was a farro and butternut squash side dish. 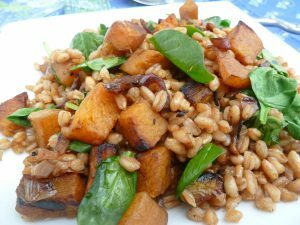 Try my version of this Farro Butternut Squash dish, which is similar. 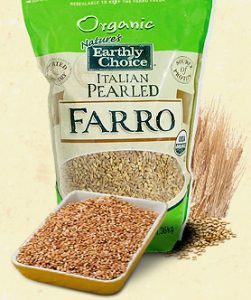 In this country, farro is sometimes confused with spelt, another ancient wheat. Spelt is sometimes sold as farro, but they cannot be used interchangeably: cooked spelt becomes mushy especially compared to farro, which maintains its texture even when over-cooked. Farro is sold whole, semi-pearled, or pearled; these labels indicate to what degree the hull has been removed. Whole farro, which has an intact hull, will need to be soaked overnight and then cooked for up to two hours, whereas the semi-pearled and pearled farro can be rinsed and boiled for only 20 – 40 minutes. The pearled versions have slightly less fiber, but maintain the same high protein level. Most farro sold in the US is hulled to some degree. Costco sells semi-pearled farro in 2-lb bags for under 8 dollars. High-end grocery stores, Whole Foods-type stores and health food stores also sell farro for a higher price, unless you can find it sold in bulk. Farro is readily available online for a price similar to Costco’s. When cooked, farro has a chewy texture and nutty taste that make it an ideal choice for versatile and flavorful soups, pasta and salads. It also holds up well in grain salads because of its dense, chewy bite. When dressed with vinaigrette, tossed with seasonal vegetables and topped with cheese, it makes an easy summer dinner. 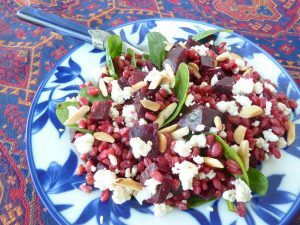 Try my Roasted Beet and Farro Salad, warm or cold. Farro with tomatoes, cucumbers, red onions and balsamic vinaigrette makes a nice sumer salad. Farro is also delicious tossed with sautéed mushrooms, onions and garlic, or simply used as a warm side dish, cooked with low-sodium stock instead of water, to replace pasta or rice at dinner.  Enjoy a new flavor sensation by taking April’s (2012) Healthy Challenge: add farro to your family’s diet and let us all know about your experiences by commenting on this post. You and your loved ones will enjoy eating Pharaoh’s wheat because of its delicious nutty flavor and wonderful texture. The added bonus: it happens to be very healthy! This high-protein seed is commonly confused with marijuana, but it's actually from a different plant in the same family. Although it doesn't contain the psychoactive substance found in marijuana, it is loaded with impressive nutrients.